If you like tri-tip, you need to try Buckhorn Grill. The Grills are an offshoot of the original Buckhorn restaurant in Winters. The Buckhorn has long been known for serving Certified Angus Beef that has been aged for 21 to 42 days. They also serve great game such as antelope, buffalo, and duck. The Grills are a semi-fast food offshoot of the restaurant. After they had success selling tri-tip sandwiches at the Napa farmers' market, they opened their first Grill and now they have a total of six throughout northern California. The one in Sacramento is located at 18th and L Streets. You order up at a counter and then your food is served up in about five minutes. They are most famous for the tri-tip, but they also serve salmon and chicken. I agree that the Buckhorn's tri-tip is of the very best quality and never see a need to order the salmon or chicken. The meat has been aged 21 days, marinated, rubbed with seasoning, and then cooked over a wood fire and smoked. The meat is always tender and delicious. Another favorite item at the Grill is their Roadhouse Onions. If you like onion strings then I would say the Grill has the best I've had. Their onions are sliced super thin, battered and the deep fried to perfection. What makes them stand out is that they are super light, crisp and totally greaseless. Other restaurants the strings will be clumped and a bit mushy from grease. Not here. 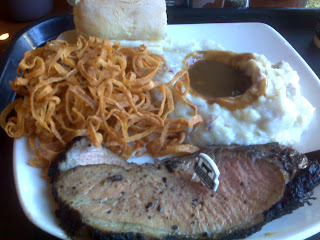 I'm a small eater and so usually I just order the small plate of tri-tip and Roadhouse Onions. But the other day I went for the full plate which includes a roll, mashed potatoes and roasted veggies. I switched the veggies for my onions, but was really disappointed in the mashed potatoes. They were like potato porridge after having had too much milk added to them. I was remembering the movie Close Encounters when Richard Dreyfuss starts sculpting a giant Devil's Tower out of mashed potatoes. They were nice and stiff. If you had used my Grill potatoes it would have been the mudslide down the side of the mountain. But generally the food is good and the service is as well.